Location: Watching Douglas Engelbart's "The Mother of all Demos"
Many of us who have dabbled with virtual worlds have wondered how they could form a constellation of networked systems, in much the same way as the Internet's servers do today. Whatever the fate of this niche technology called virtual worlds, from the failure to run on mobile devices to the inherent boom-bust cycle of Second Life's particular brand, the road not taken always beckons. There is an historical precedent here, and it's one that has a happy ending. Could the same be true for virtual worlds? For a moment, consider the complex and delicate magic that occurs whenever we use the Internet. My university server talks fine to Google, for work such as the just-completed Usher project. Whenever the Outlook mail client randomly eats student file attachments sent to me, I smile. Ah, Microsoft's wonderfully Byzantine and wonderfully doomed, technology, eating even its own Word files. Cue Apple and Google, as the Ottomans on the horizon, slowly gobbling up a once mighty empire. Good riddance. Then, because of the lack of monopoly that Microsoft coveted and almost got, I have the students try, try again with Gmail. Excede's servers send me the results and, once I type, transmit my thoughts--profound or inane--from home travel via satellite to Google. When I send notice of this post to interested folks at Twitter or Facebook, the servers hosting that data all "talk" to one another. Types of Gardens and a World-Wide Web, 1975? Compare that to virtual worlds technology, ostensibly part of the Internet since that is how we access it. Second Life, InWorldz, and many others that share core technologies could, in theory, speak to each other. Had development not branched off as it has done, Linden Lab and a few other grids might have pioneered a system for avatars and inventory to travel from world to world. That happens with OpenSim Hypergridding, a technology that John Lester promoted, before his work for Reaction Grid turned to Jibe-based 3D worlds. But "interoperability" died years ago at Linden Lab, and it seems unlikely to return. It's curious, this set of walled gardens. If today the Internet resembles Borges Garden of Forking Paths, Virtual Worlds resemble something else: the road taken in the 1970s toward personal computing. The Internet did not begin with Al Gore, whatever he may have claimed. It did not begin in Jobs' family garage and with Steve Wozniak's brilliant hardware hacks. It did not begin at Xerox PARC with the Alto. The personal computer with a GUI and mouse? Yes, we can credit or blame Xerox and Apple for that. 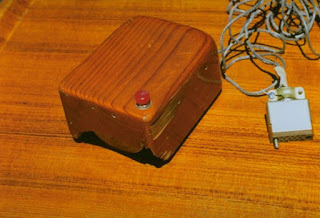 But years before, nearly every element of the modern Internet would have been possible with the Augment system, developed under the leadership of Douglas Engelbart. Yet that development stalled and ended, a revolution stillborn. I think we can see an analogue for what is going on, at this cultural moment, with user-generated virtual worlds. Want to see what might have been for the Internet? I am convinced that had something like Augment been made less opaque for casual users, we'd have had an academic, and perhaps consumer Internet in 1975. 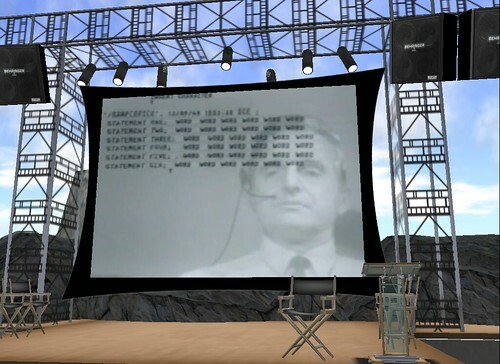 Engelbart gave a show-stopper of a demo in 1968, with mouse, text-editing with clipboard and copy/paste, multiple files, graphics on screen, electronic mail, hyperlinks tagged to graphics, and remote visitors via a network. You can see what he was doing with Augment at these videos from Stanford. The reasons for Augment's failure are complex; Markoff's book does justice both to the creator's vision and his ultimate failure to produce a widely adapted product. What happened, however, for consumers was the emergence of walled gardens and proprietary systems from Apple, Microsoft, Digital, Tandy, and other competitors forgotten except by historians of technology. When the Internet emerged, it came late to a culture of desktop boxes that could not, generally, talk to one another. What if Virtual Worlds Had Begun with Interoperability? I'm writing an article about one group of USENET hobbyists who have made the jump to Facebook, because the old .alt group proved too chaotic and full of spammers, trolls, and other bottom feeders. They also made the leap because, frankly, .jpgs and text import and export well between applications. Text did in Engelbart's day. Little aside from these, plus Collada files and some other graphic formats, can move between different virtual worlds. Standards for inventories, for avatar meshes, and for "land" templates are different. In this technology landscape, OpenSim grids serve as today's Augment. Managing a bunch of avatars and a region in OS is hard to master, not stable in my experience except in the hands of a pro, but interoperable. Running an entire campus-hosted grid would be lovely, but it's beyond my time or expertise to learn. Other products with potential beyond SL's technology, such Unity 3D and Jibe, produce elegant worlds, but they don't talk to other worlds and expert designers need to craft objects. They do offer vast potential, according to OpenSim pioneer Adam Frisby, for scaling, running on mobile devices, and improved grahics. That sounds great until one considers faculty skills-sets and what it takes to build with Unity or Jibe. As noted before in this blog, developing for these platforms may be within reach for architecture and engineering students, but at my university, it's challenge enough to get students to juggle multiple e-mail accounts and embed files from YouTube into their blog posts. We faculty lack time and incentives to do more with them, let alone learn 3D applications such as Maya or Blender. Yet nearly all of us at my school have created content, mostly with text and images and sometimes digital video, and shared it on the Internet. For all its limitations and toxicity as a brand, Second Life and, lets amateurs with a copy of Photoshop build easily. I'm told that Cloud Party does too, and I will soon try again with Cloud Party's latest build tools. Scripting remains something for those not faint of heart and projects to make visual scripting tools, such as MIT's Scratch for SL, remain as stillborn as Augment. Here comes a sweeping generalization, and I'm ready to fall on this sword if some wise person can prove me wrong. Virtual worlds will never be a disruptive technology, in Tim Wu's sense of the term, until they become an interoperable and popular tool for everyday life, as the Web and e-mail have become. Had virtual worlds begun with a series of collaborative academic ventures rooted in common standards, rather than a group of for-profit start-ups from The Valley, we might have that disruption and a 3D Web today. Then the profits would follow, because in 1968, who could have foreseen eBay or Amazon or Facebook? Right now, however, it's still 1968 and we've all seen the potential of a disruptive technology, as those who watched Engelbart's presentation did. So today, who will build the 3D Web?